Live Oak Writing Project and Prairie Lands Writing Project use visioning retreats to explore the continuity opportunities that their respective sites need and can support. Through their intentional work at visioning retreats, both sites have expanded their leadership, built site capacity, and supported new learning. 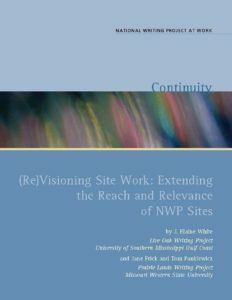 (Re)Visioning Site Work: Extending the Reach and Relevance of NWP Sites includes rich material that other sites might adapt or replicate to plan visioning or other types of retreats. Extensive appendices include documents that are appropriate for immediate use. Each site has different objectives in engaging in visioning retreats, but both share a reliance on a vehicle (visioning retreat) to bring together key leaders at a site to think collectively about the sustainability of the site. The monograph describes in detail both sites’ planning process and subsequent results.